We've been doing a lot of Science experiments at home. Science provides a lot of opportunities for young learners to read and write. Plus, my boys don't realize they are doing so much reading and writing when it is hidden in a science experiment! They are happy exploring their environment or trying to figure out what might happen next. They love our science time so much, I've started bribing my oldest to go to school each day with a "I'll let you do a science experiment when we get home." Pathetic. I know. I plan on sharing some of our favorite science activities for kids over the next few weeks as well as some favorite science picture books. A few weeks ago I shared a play dough monster science activity that we did with the book Monsters Love Colors. This week, I am continuing with a fall theme-- but not Halloween. We have many beautiful leaves falling from the trees at this time of year. We recently did a little science art with the beautiful fall colors. We began our study by reading the book, "You can use a Magnifying Glass" by Wiley Blevins. In this informational text book, large, clear illustrations and labels help children to identify the parts and purposes of a magnifying glass. There isn't a great deal of text in this little book, but the clear photos of scientist, police, and jewelers using magnifying glasses give a good introduction to this science tool. After we observed others using magnifying glasses in the book, we tried it out ourselves. I use the Bible and Rhyme Curriculum with Tyson (age 3). We also did a fun art activity from the curriculum. 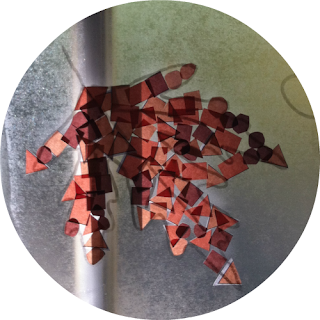 I drew a leaf onto contact paper and cut tiny shapes out of fall colored papers. Tyson stuck the little shapes all over the leaf. We worked together on this. I filled in the outline and he filled in the center. He loved doing the activity, but it was tedious fine motor work for a three year old. He seemed to enjoy my help! The leaf looks like a colorful leaf from a distance. When you walk up close, or look with a magnifying glass, you can see the individual shapes in the leaf. We also went outside and collected leaves and observed those with our magnifying glass. We have several favorite leaf themed books that we read after observing those leaves. For more Science Activities for Kids check out Science Lessons for Kids on Pinterest. I pinned this last night but must have been tired as WOW, WHAT A BEAUTIFUL PHOTO! The ideas are wonderful and the photo with the circles and all is the frosting on the cake. Impressive! Thanks Carolyn! I've been dying to try out the circles on picmonkey and this seemed like a great post to try!! 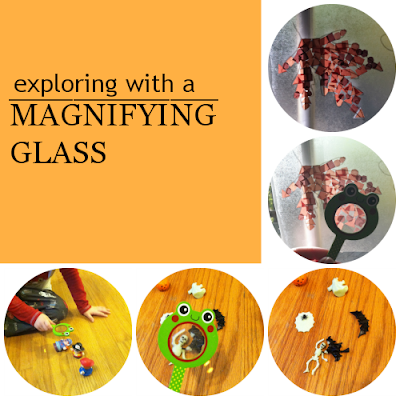 When we were first using magnifying glasses for hands-on science we had a blast too. Seeing things up close is always fun for the little ones! Thank you for sharing and for linking up this week to the Thoughtful Spot Weekly Blog Hop. My little guys wanted to hold the magnifying glass right on their eye, so it was fun to watch them learn how to really use science tools. Thanks for hosting the Thoughtful Spot! 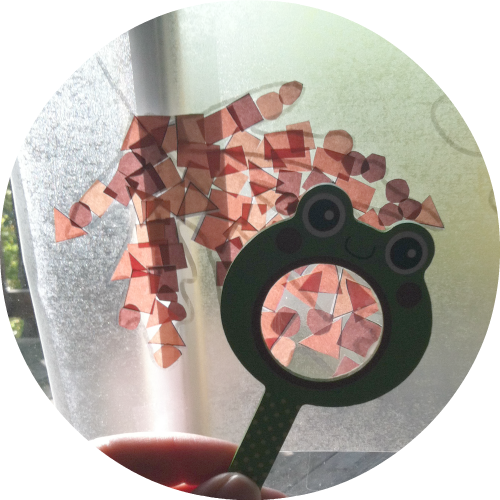 Where did you get the adorable frog magnifying glass? Thanks for the post! I think the frog magnifying glass was from Target... But it's been awhile. We have a cute bumblebee too. I love them. I am with you on science. I wish there was more of it in school and more time for it at home. Thanks for sharing with Afterschool! My five year old loves his magnifying glass. Thanks for some ideas for using it! Glad to see you linked up at After School.